ECG/NTE parts are a general replacement product line that can be used to replace over 200,000 different components. The original ECG series was developed by Sylvania, and was later acquired by Philips. In 2001 the component line became a division of NTE. 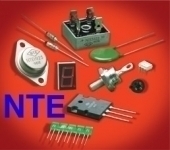 If you're having trouble finding a replacement for a transistor, IC, or other semiconductor, NTE parts can often save the day. The company maintains an excellent online database that lets you easily find correct replacements. Some of our stock is branded and packaged under the ECG name, other parts are labeled NTE. The parts are exactly the same, and can be used with confidence.